It’s that time of the year when we’re all thinking about how clean our homes are. The Marie Kondo craze has many of us clearing out our closets and cabinets in order to make our homes free of clutter. But have you stopped to consider how clean the air in your home is as well? We spend approximately 90 percent of our lives indoors, and evidence suggests that indoor air is more polluted than outdoor air. Here’s some advice on how to clean and improve the quality of the air in your home. Everyone knows that cigarettes are harmful to your health – both for the smoker and for those who are exposed to secondhand smoke. According to the Surgeon General, even breathing just a small amount of secondhand smoke can be harmful. The best way to improve the air quality in your home is to not smoke indoors. Radon is the second leading cause for lung cancer. It’s an odorless, tasteless radioactive gas that is released from the decay of elements in rocks and soil. The only way to determine if harmful levels of radon are present in your home is to have it tested. One of the easiest and most inexpensive ways to clean the air in your home is to simply open the windows. Even if you only open them for a few minutes a day, it’s enough time to get the air moving so that indoor pollutants can be dispersed. Houseplants aren’t just great for decoration. They can also help filter the air in your home. In fact, the American Society of Horticulture Science has determined that there are three houseplants in particular that can reduce ozone levels in your home – snake plants, spider plants, and golden pothos. Instead of using scented candles, which perfume the air, opt for essential oil diffusers. Not only do the fragrances of the oil make your house smell nice, they can also cut down on pollutants. Essential oils such as tea tree, eucalyptus, rosemary, and clove have antibacterial properties and can help reduce dust mites. Are you using harsh chemicals to clean your home? They can actually be contributing to your problem. Toxic chemicals can cause irritation and should only be used as a last resort. Instead, opt for natural cleaners like vinegar and baking soda. Every time you run your air conditioner, you’re cleaning the air in your home. That’s because most AC systems use a filter that traps particles before the air is pumped back into your home. Be sure to replace the filters as often as the manufacturer recommends. Pet dander can be a major problem for some people and makes asthma symptoms worse. Help keep the air clean by brushing them outdoors frequently and vacuuming regularly. Did you know that Himalayan salt lamps not only add a pretty glow to your room, they also help clean the air? 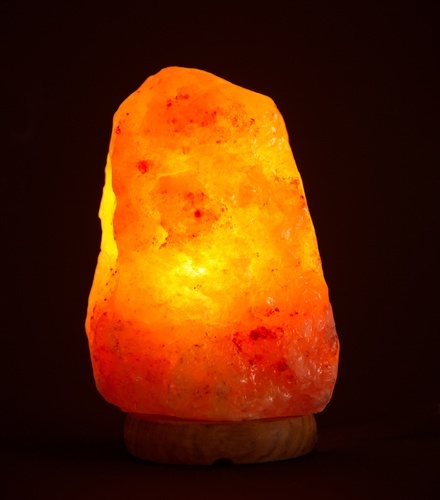 The warm bulb inside heats the salt lamp, which releases negative ions into the air. Negative ions help to keep the air clean, much like the clean air you find on ocean beaches.